If you’re tired of seeing stacks of boxes surrounded by gray concrete, or if you finished your basement ages ago, it may be time to remodel. The basement is a perfect space for entertaining, playing with your kids, or relaxing in a second living area—why not take advantage of it? But first, you need to know how you want your basement to look. We hope the following list of remodeling ideas for basements will spark some creativity. You don’t have to choose between using your basement as a storage space or a space your family can live in and enjoy. If you need a lot of storage but don’t want to see all those tubs and boxes when you’re spending time in your basement, consider installing a wall of cabinets and shelves. This will provide plenty of storage space but will look sleek and tidy. If your staircase and basement are separated by a wall, a great way to open up the area is to remove the wall, if your structure allows for it. This will create a whole new atmosphere for your basement and make it look larger. You might also consider putting the space under your staircase to use. This area may be small, and sometimes awkwardly shaped, but there are plenty of options for it. If you need a workspace but can’t use an entire room as an office, an under-the-stairs desk might be the solution. If you’re an avid reader, you can transform that space into a cozy reading nook. Wine connoisseurs? 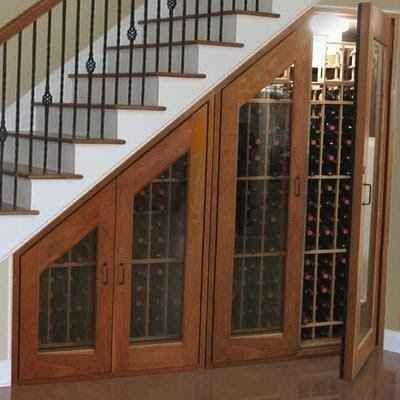 Maybe you’d like a unique a miniature wine cellar in your basement. You can really get creative with this one! Even though your basement’s support poles serve an essential purpose, they’re not very pretty—plain concrete poles practically scream “unfinished basement.” Try dressing them up with material like stone or wood to dress up the area. One option that is both popular and practical is to transform your support poles into shelving, killing two birds with one stone. With a floor-to-ceiling column of shelves, it’s a great way to store books, boxes of the kids’ toys, or knick-knacks, and also provides that much-needed support. Opt for a unique, trendy floor. Save yourself some time deciding between hardwood, carpeted, or tile floors and opt to keep your concrete floor—now bear with us for a moment. Some homeowners are choosing to make over their concrete floors by acid staining. Acid-stained concrete floors have become quite trendy, and for good reason! This flooring is a cheaper option than installing carpet, wood, or tile, and is easy to clean. Plus, the stain creates a unique visual effect. One thing to keep in mind, though, is that the hydrochloric acid is very dangerous to work with. If you’re not comfortable with a project like this, the Bailey Company is a phone call away.